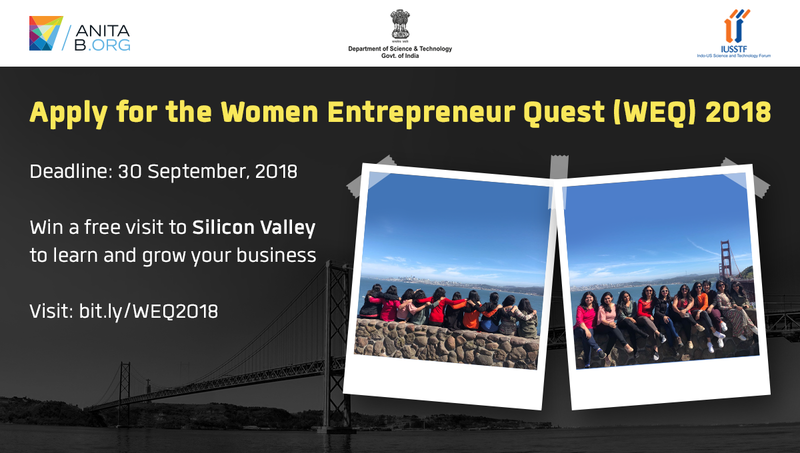 The annual startup contest, the Women Entrepreneur Quest (WEQ) 2018 applications are open. This is a great opportunity for women entrepreneurs in India, who are founders of startups in the technology sector. The Top 10 winners of WEQ 2018 will receive an all-expenses-paid experiential learning visit to Silicon Valley, US. On this trip the winners will get access to networks, guidance and inspiration by some of the best in the Valley. The applications for Stage 1 of the selection process close on 30 September, 2018. Click here to know more about the opportunities and great experiences of our past WEQ winners. Please share this exciting opportunity among your networks.